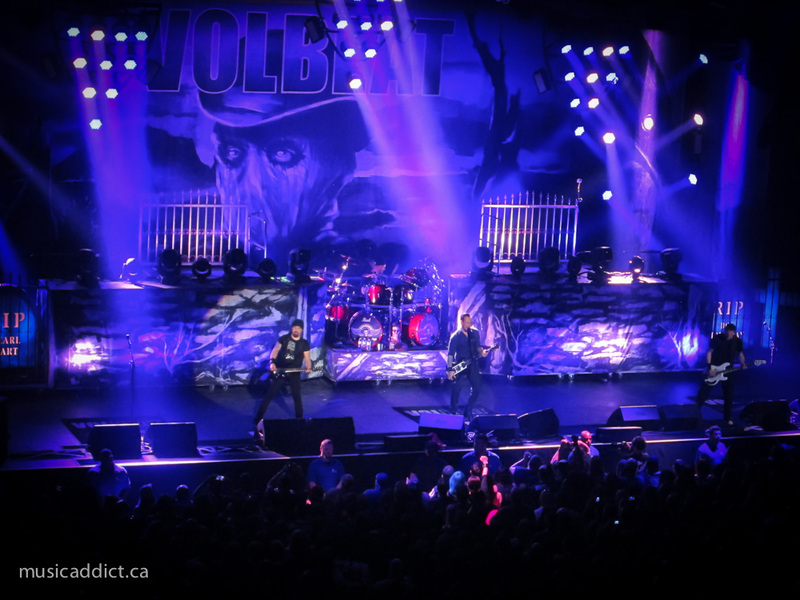 Volbeat was in town last night, on the last Canadian stop of their “Outlaw Gentlemen and Shady Ladies” tour, along with Anthrax and Crobot as support. This was surprisingly the Danish rockers’ first visit to our city, and their fans (of all ages) were eagerly awaiting their arrival on stage. 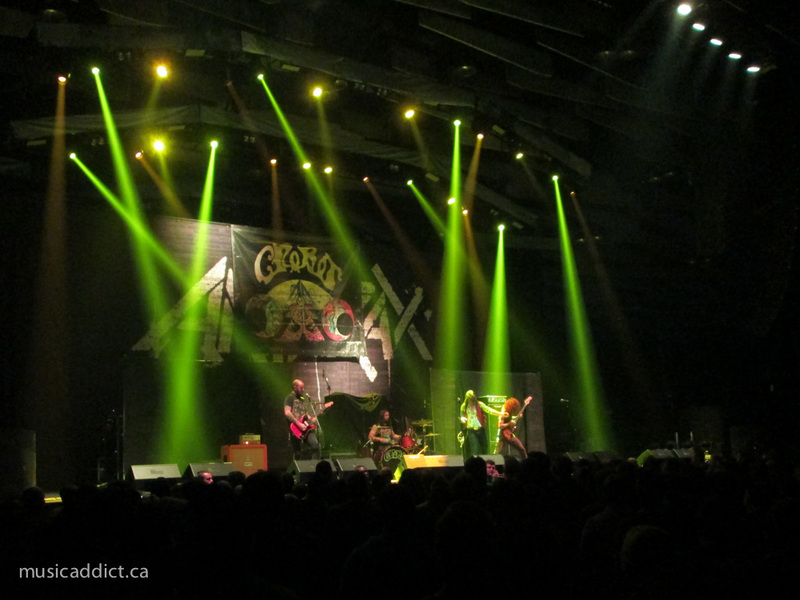 First up was Crobot from Pennsylvania, who played a solid set of groove-based hard rock, kind of similar to Wolfmother or Monster Truck. The fans who showed up early enough to catch their set were rewarded by a solid performance that probably got them a few new fans. They’ve got one album (Something Supernatural) and an EP (Crobot) out, and are worth checking out. 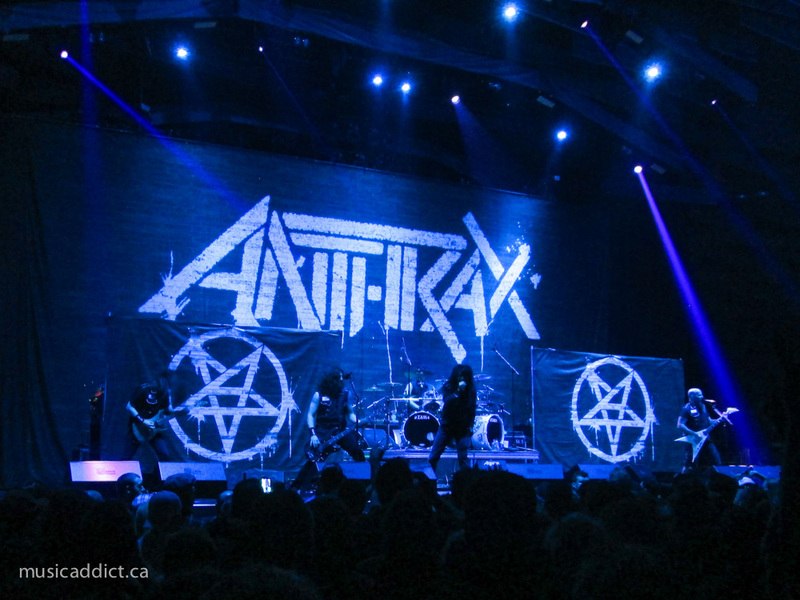 Then came the veteran thrash metallers of Anthrax. I wasn’t too sure about how well they’d fit in with Volbeat, and they certainly weren’t in line with Crobot’s music either. But from the promoters’ point of view, it made a lot of sense as both bands drew a somewhat different crowd (you could even sense the turnover on the floor between each band). The band didn’t waste anytime setting up the mood as they launched right into “Caught in a Mosh”. Singer Joey Belladonna walked the stage relentlessly from left to right, but bizarrely spent an undue amount of time trying to convince people to light up joints. Maybe he was hoping they’d share? 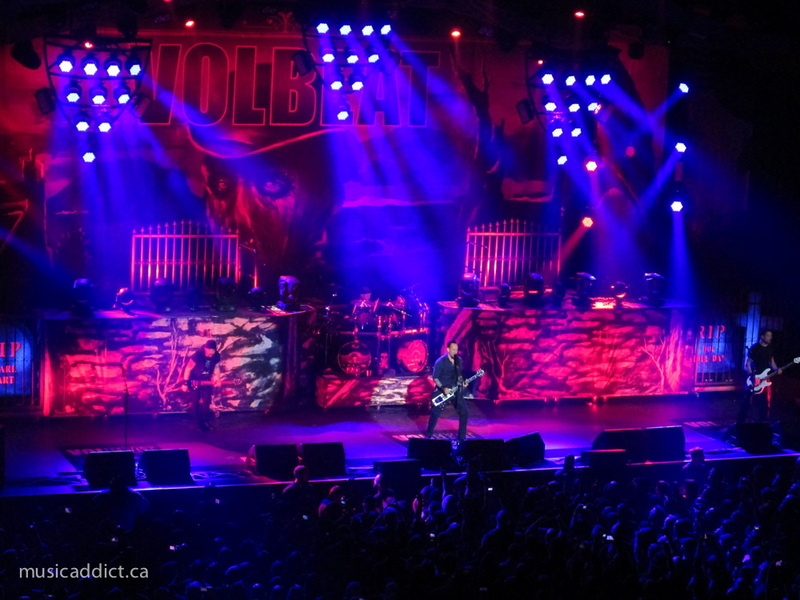 Bassist Frank Bello was his usual maniac self, guitarist Scott Ian laid down one airtight riff after another, while newcomer Jon Donais (from Shadow’s Fall, who replaced Rob Caggiano who left to join… Volbeat) stayed mostly in one spot, letting the others carry the show. On drums, Jon Dette filled in for the still sidelined Charlie Benante (see my interview with him here), although this is supposed to be his last show before Benante comes back. The CEPSUM doesn’t have great acoustics (it’s a university hockey rink, but the stage is set up sideways as there are seats on only one side), and the more frantic sections of their music suffered a little, but it was still a good show. 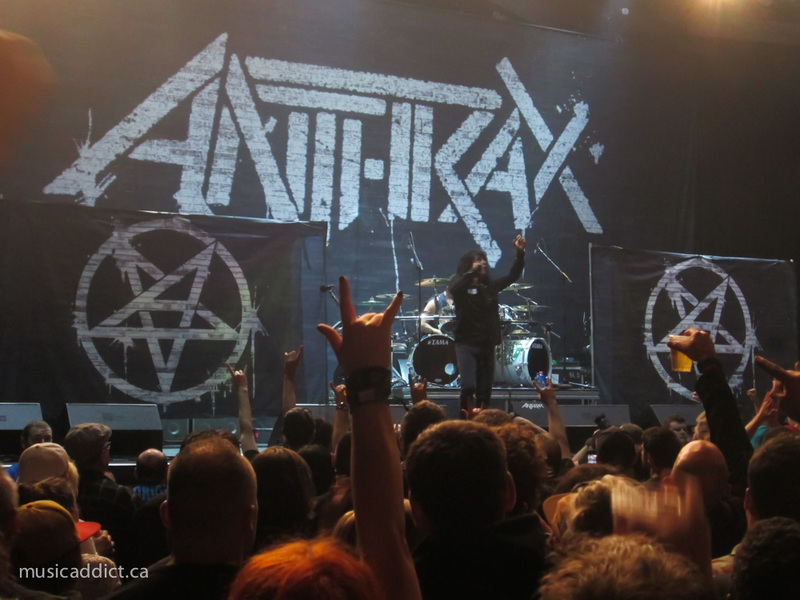 Anthrax really comes alive in concert, and a lot of their material just has that youthful energy that gets a crowd going no matter what. 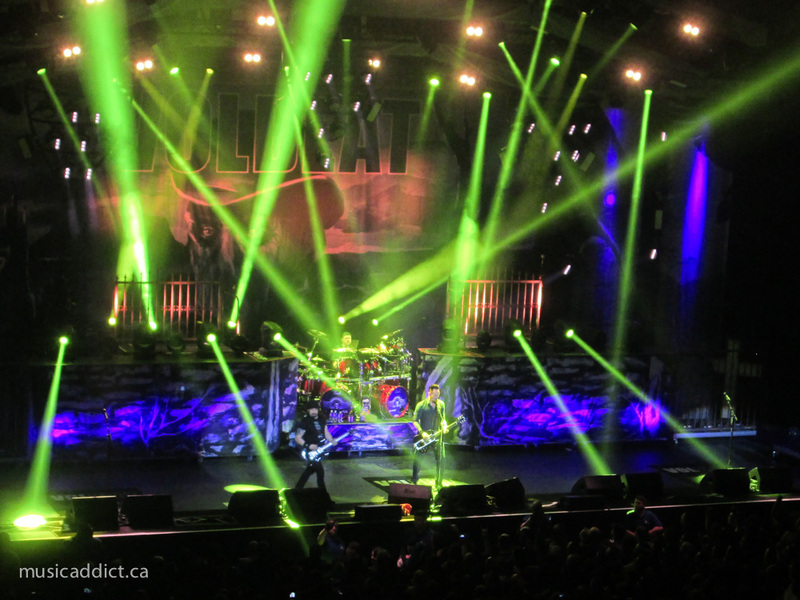 The set was mostly classic songs, with 2 from their latest “Worship Music” thrown in, “Fight ‘Em Til You Can’t” and “In the End”, their tribute to the late Dimebag Darrell and Ronnie James Dio. I love that song, but live it struggles to project the majestic quality it has on record. It’s not that it’s bad in concert, but it doesn’t come across the same way it does on record. I always complain that they spend two slots of their short opening sets (they played 9 songs) on covers: the perennial “Got the Time” (originally by Joe Jackson) and “Antisocial” (originally by french punk band Trust), but these songs always get the crowd going (especially the singalong chorus on the latter). Still, I’d love to see them bust out something else from “Spreading the Disease” or “Persistence of Time” from time to time. A new song, “Soror Irrumator” (from the Game of Thrones inspired mixtape “Catch the Throne Vol 2”) was played and if it is indicative of their writing for the new record, fans will be happy. 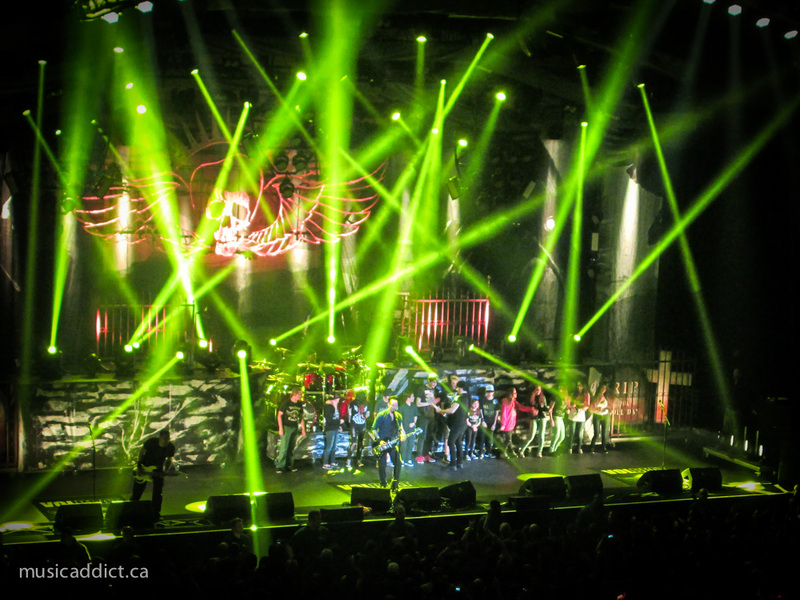 The show ended with the classics “I Am the Law” and “Indians” (both from their seminal album “Among the Living”) with a big moshpit forming for the “Wardance” section. Excellent show from a somewhat underrated band. The floor filled up quickly in anticipation for Volbeat. I didn’t know what to expect from them, as I only knew a handful of songs. They played a solid set with their strange (but effective) blend of rockabilly, metal, and 50’s rock ‘n roll. Singer Michael Poulsen is the focus of attention, as he moves from microphone to microphone on the stage and engages regularly with the crowd. His particular vocal tone is often cited as the make or break factor for people liking this band or not, but it’s safe to say that most everyone in the building fell into the “make” side of that argument. The stage was flanked by fences and tombstones bearing the names of famous outlaws, to keep to the theme of their latest album. Two similar platforms were set above the stage on either side of the drum kit but were sadly underused as the band members only made their way there once, briefly. 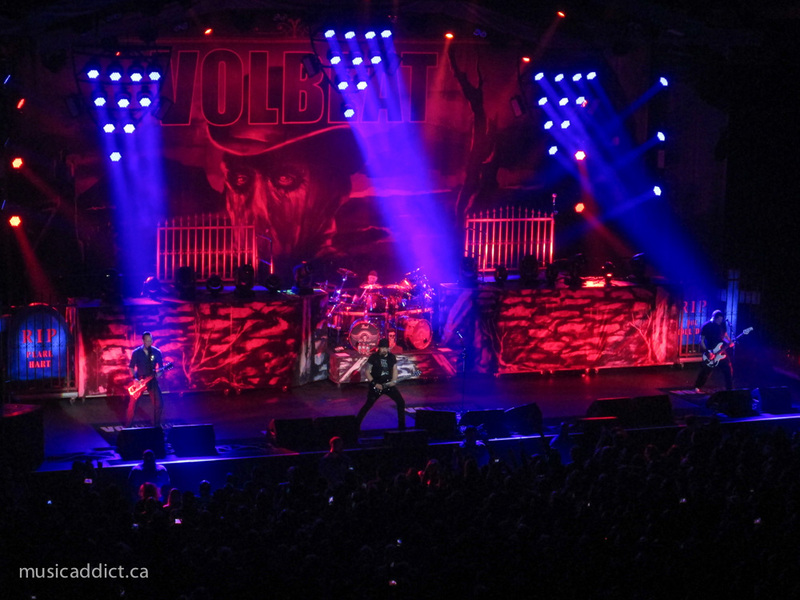 Former Anthrax guitarist Rob Caggiano seems much happier in Volbeat, and he played all over the stage, serving up crunchy riffs and blistering solos. 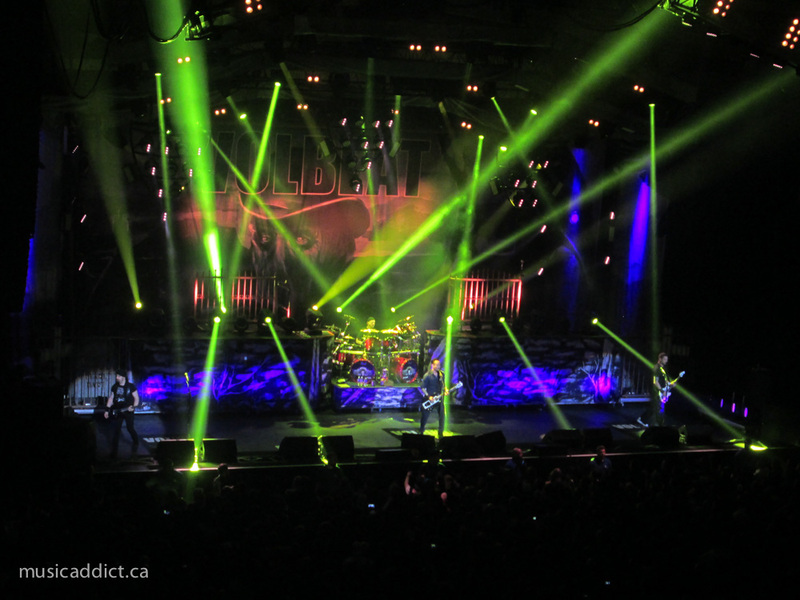 The band’s melodic metal makes for great concert material, and the crowd reacted to every riff and sang along to every chorus. I even spotted a few “old timers. playing air guitar in the stands! 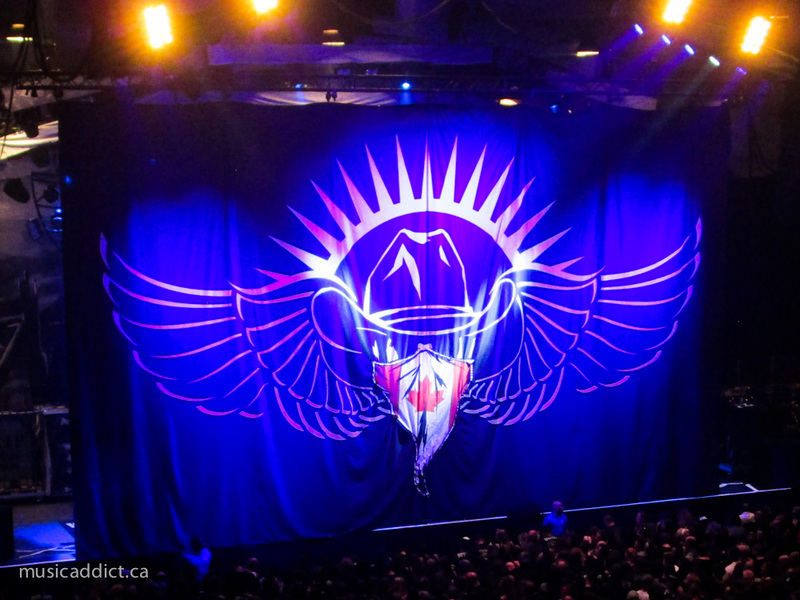 That is one of the great things about this band’s fanbase: they reach across all generations. Very young kids were there (they even got invited on stage), teenagers, young adults, even first generation headbangers, all rocking out to their music, all united in they love of metal. The show ended with their classic “Still Counting” which got the best reaction of the night. Kudos on this band for a great show. Their brand of metal is probably not for everyone, but they’re original and put on a great show. 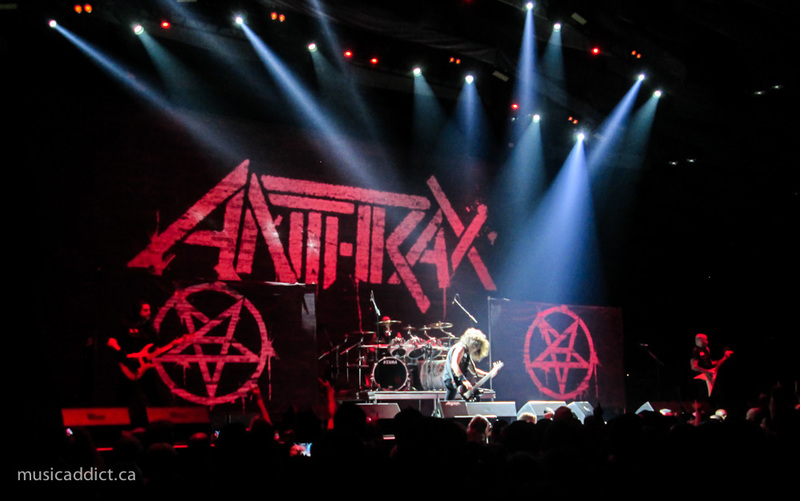 ← Interview: Charlie Benante from Anthrax on new album, music trends, metal and… coffee.